DC-DC Converter: A two 250 W DC-DC converters sincronized (current shared) working in parallel for a high power, fault tolerant solution, giving a rated total power of 500 W at 24 V DC single output. It includes a monitoring PT100 temperature sensor and optonal insulaton monitoring device to detect current leaks. All elements are housed in a pressure-tight cylinder. 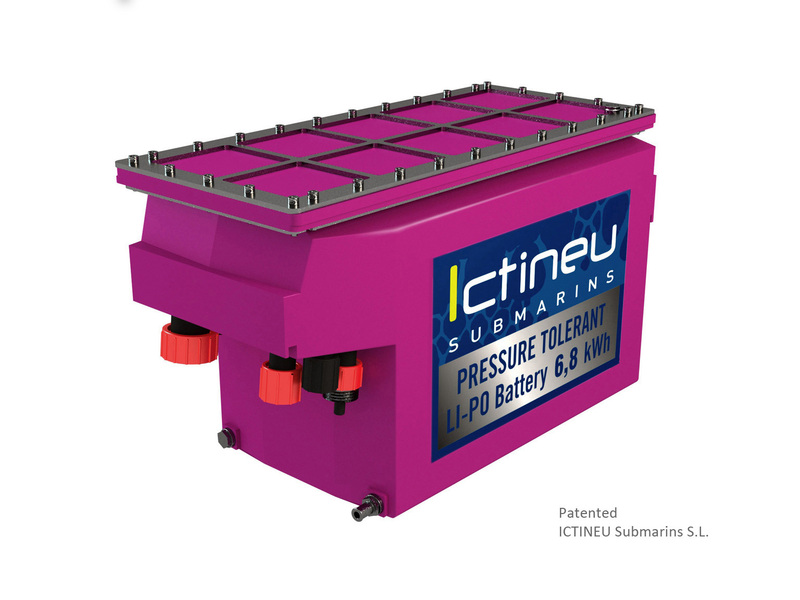 Ictineu Battery Charger: The ICTINEU battery charger has been designed for the purpose of charging Lithium Polymer batteries provided by ICTINEU Submarins S.L. This charge system has been developed to safely charge lithium polymer batteries. It is integrated into a robust, watertight rolling case and it includes all the necessary safety systems and cables. This battery module has been specially designed to be compliant with DNVGL classification authority rules for the classification and construction of submersibles for the application in manned / unmanned submersible vehicles, rated 6 000 m. This ensures the highest standards of quality and safety in design, manufacturing and performance. The result is a very compact pressure compensated battery module offering a very good weight and volume to power ratios, 148 V DC, 6,8 kWh in a box containing the BMS, the control circuit, the protective elements, charge / discharge and monitoring / control contactors. Graphic User Interface (GUI) software provided: Can be installed on a computer and monitor battery status, charge and discharge. It can also allow remote configuration of the battery parameters by ICTINEU Submarins if needed.